I think most people get into grooves (or ruts) in their lives about where they go, who they call a friend, places they shop, hobbies they do. Driving for Uber is an amazing way to see, first hand, people’s lives beyond one’s normal paths. Uber takes you, as a driver, all over. You go where the next passenger is, and you go where they want to go. It’s fascinating. I wanted to share my experience. How did you determine your format? It came to me. I didn’t pre-think it. I sat down, opened my laptop and wrote. I gave my first passenger’s experience a subhead, followed it with a short story, and followed that with what I call a “key experience,” or what I got from the ride. Why did you offer the book for free on your blog before choosing to publish as a book? What is your favorite Uber story? Ah, my favorite one isn’t published yet. But in this book, my first, I found the passenger in “He likes the pasta” to be a very sweet experience. This kid got in my car. Our lives were worlds apart. And yet we shared this tender-to-me moment in time together in the car. Sometimes with younger passengers, I feel like I’m their mom or aunt giving them a ride. Recent news stories have caused great concern for both Uber drivers and passengers. What do you have to say to those who are worried? Chill. If you have a date with disaster, you have a date with disaster … whether it shows up in the form of an Uber driver or someone else. Fear less, love more. What is the greatest lesson you have learned from Uber? To go with the flow. I have no control as to where I’m driving to next. The passenger’s destination is not made available to me until after I accept the ride. I control when I drive, but not where I drive to. What advice do you have for those who wish to give Uber a try? Do it! If nothing else, do it as a bucket-list experience. What lessons do you want people to pull from your book? I think that one of the greatest gifts we can give another (and ourselves) is the gift of witnessing another’s life, without judgement or need. Simply to witness. I feel I get to do that with my Uber driving, and I believe I help others, my readers, witness my passengers for a moment in time. You talk about having a side business. Tell us about that. Do I have a side business?! Yes, I’m very into the gig economy. I’m a Nerium Brand Partner and sell anti-aging products; I do #bizdev for a digital marketing company; and I run a community website, two actually. You mention that you used to blog. Are you still blogging? Rarely. I find I get more engagement on Facebook, so I “blog” (write longer posts than a simple status update, that is) there sometimes. You like to read a lot while waiting for jobs. What are you reading right now? The Soul of an Octopus. The full title is The Soul of an Octopus: A Surprising Exploration into the Wonder of Consciousness. Only that I’m grateful for this interview and the good work you do in the world. Have you ever wondered what it would be like to drive for Uber? Have you ever been curious as to what kind of people use Uber? Where are they going? What do they talk about during the ride? How do they behave, or misbehave? 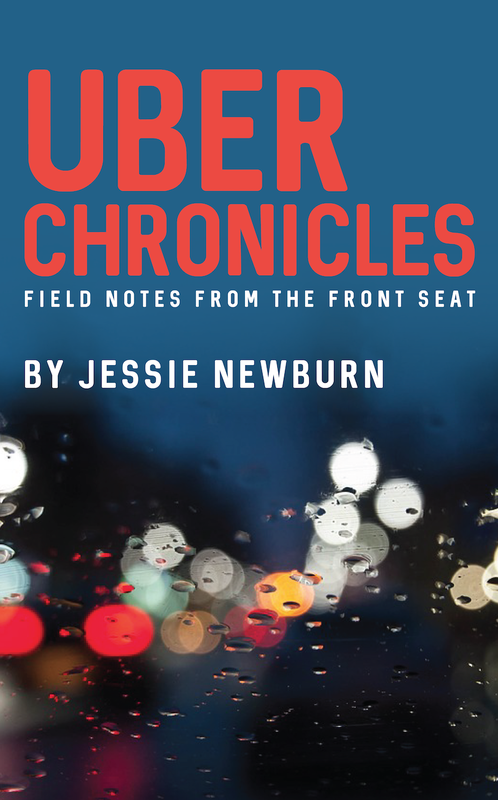 Jessie Newburn never planned to write about her experiences as an Uber driver. Heck, she never even thought she'd drive for Uber. But there she was one day, desperately needing to Just.Do.Something, and so she decided to Uber. After a few nights out, she came home and was taken by the thought that what was happening inside her car was interesting. And so she wrote. And wrote. About each and every passenger. "Uber Chronicles: Field Note from the Front Seat" is her first book in a series. Beyond this book, Jessie has embraced the gig economy, doing #bizdev for a digital marketing firm, hawking anti-aging products, managing a community site in her hometown, and doing various and sundry other gigs. She forages (in meadows and in friends’ refrigerators); dances contra, zydeco and waltz; champions the thoughtful and intelligent use of social media (particularly on the local level); travels to Black Rock City often; and advocates for an updated conversation about cannabis and psychedelics. While she ponders—seemingly incessantly—whether she should (1) move to a place with more land and, idyllically, more room to grow more food or (2) move to the city and have a smaller footprint, for now she continues to live in one of the suburbiest suburbs in the world: Columbia, Maryland, which is both conveniently and not conveniently located between Baltimore, Annapolis, and Washington, D.C.